Over the coming years we can all expect to spend more time staring at our download dialog boxes, waiting for our music or our videos to buffer and clicking away impatiently as we wait for our web pages to reload. And it will not be the OS or our internet service providers who are to blame. It will be the effects of global warming. 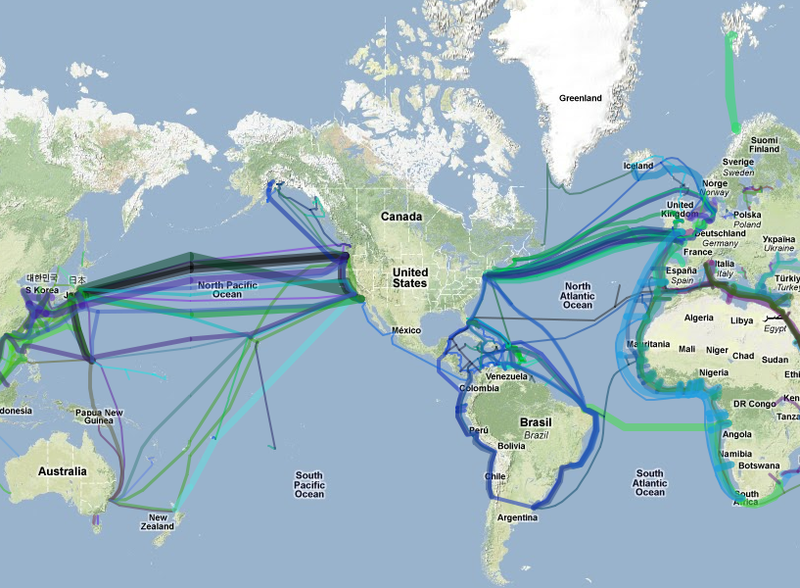 As global warming sets in and the seas warm the performance of all the undersea cables that are a critical part of global connections will be affected. A significant part of voice and data signals are transmitted through these cables and many communications services companies are entirely dependent on them. As the seas warm they will absorb increasing amounts of carbon dioxide from the atmosphere and turn acidic. While fish and all marine life have evolution to fall back upon and will adapt to the changing conditions, undersea cables being inanimate and unable to reproduce will suffer. Firstly the increasing temperature itself will cause the component fibres in the undersea cable to expand; both in length and in diameter. Secondly the acidic environment will cause them to corrode and distort. These cables, which connect land-based transmission terminal stations across continents, are laid for tens of thousands of kilometres along the seabed. It is well known that these thick optic fibre cables can be disrupted due to many natural phenomena, such as temperature, earthquakes, extreme turbidity, current, or by coming in contact with fishing vessels or being attacked by marine life ranging from plankton to sharks. It has now been shown conclusively by research at the International Marine Cable Research Centre (IMCRC) that increasing global temperatures will lead not only to the slowing down of signals as the marine cables expand in length, but that the integrity of signals being carried will suffer as the cable distortions lead to intertwined parallel signals getting mixed up with each other. Just having cables in parallel cannot solve this problem. Global warming will affect all the cables. Longer cables will be affected most. Scientists at the IMCRC have modelled the performance under deteriorating conditions and calculate that these cables could become completely unusable as quickly as within 1,000 years. “We are working on an innovative solution”, said Dr. Peter Sellers, Director of the IMCRC. The International project to find a solution is being led by Dr. Martin Strangelove of the University of Pennsylvania who says, “A drastic problem requires a drastic solution. We are now working on ways in which we can trigger a new ice age as a comprehensive global solution. Not only will undersea temperatures reduce but in many places alternative cables could be placed on the surface of the newly created ice sheets”.